Old and new friends abound in this 80-page blockbuster (as are ALL issues of FF these days) chronicling the adventures of comicdom’s first (and best) all-female super-team. Inside a dramatic Dell Barras cover, it starts off right away with the 31-page lead story “Rock Aria”. In the wake of the tragedy at Roberta Stock’s almost-wedding (last issue), the FF return to an emergency call from founding member RIO RITA that leads to a trip to Brazil to investigate a mysterious, hulking destructive force appearing in the Amazon jungle. Is it a terrible NEW menace? Yes-AND no. 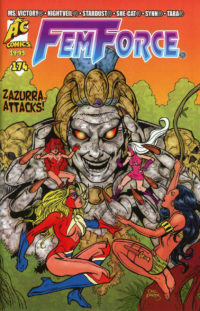 It’s ZAZURRA, the living stone giantess that actually debuted in AC’s Big ‘Uns #2, back many years ago, but who has never previously appeared in the FF universe. She’s here now, and it’ll be up to Ms. VICTORY, SHE-CAT, SYNN and TARA to deal with. Throw in a sprinkling of Dr. Carlos Jimenez and his Time Triangle, Lady Luger and Fritz Voltzmann, and it’s another Stephanie and Mark Heike, Rock Baker and Jeff Austin triumph. Then, RAD is back taking the next step on her journey toward respectability as she moves forward in her secret undercover assignment infiltrating the dangerous paramilitary subversive group The Strong Hand, in “Stepping Into The Twilight Zone”, written by Mark Heike, with art by Baker and Austin. SYNN ends up as a contestant on a game show in an offbeat solo adventure in “A Girl With Brains”, from the mind of writer Mark Holmes with pencils by Dan Gorman and inks by Scott Shriver. Penciler Dan Gorman returns to handle art duties on “The Final Days of Sirius Quinn”. TARA FREMONT investigates the abandoned jungle research facility of a recently-deceased scientist only to find a very unusual situation. Written by UK sensation Andrew Hawnt, and inked by the versatile Scott Shriver. Everybodies’ favorite reluctant heroine, YANKEE GIRL is back to deal with a deadly tropical threat at the Arctic Circle(?) in “Ice Age Baby”, written by Mark Holmes, with pencils and inks by Riccardo Desini. Finally, as a special flip-book feature, long-time AC artist Dan Gorman and his collaborator Joseph A. Michael have created an all-new superheroine that has caught on as an online sensation- The ATOMIC BLONDE!! She makes her FIRST in-print appearance here in FF #174 in an adventure set in a 1940’s World War II world just SLIGHTLY different than our own, entitled “Enter The AquaNazis!!”. We think FEMFORCE readers will love it. Add it all up and it comes out to be 80 full pages of 100% ALL-NEW, never-before-seen story and art in the great AC tradition of “good girl” art and action. Black and white interiors inside full-color covers, standard comic book size, saddle-stitched, for $9.95. Released in 2016.